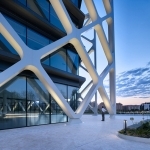 NOVEMBER 6, 2018.- Spanish architectural firm, RAFAEL DE LA-HOZ Arquitectos, unveils oxxeo, a unique office complex located in Las Tablas district in the north of Madrid owned by real estate group Gmp. 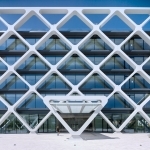 Framed by the most stringent sustainability standards, the building’s design is highly innovative. 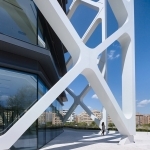 RAFAEL DE LA-HOZ Arquitectos has encapsulated in oxxeo some of the architectural values that run through many of its works: efficiency, sustainability and innovation, without neglecting an aesthetic vision, which on this occasion, relies on the structural lattice of the façade which provides solar protection. This skin maximises the amount of natural light entering each floor, making the interior feel very spacious. Oxxeo wants to set a benchmark by embracing key elements of the offices of the future such as connectivity, comfort, flexibility and sustainability. 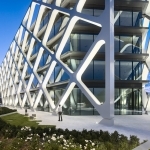 Providing five floors with flexible spaces that can easily adapt to the needs of enterprises and their professionals, oxxeo features other facilities custom designed for users, including a rooftop terrace with two padel tennis courts, a running track, an open-air exercise area and a rest area. It also boasts 450 parking spaces located in the basement, including spaces set aside for electric vehicles, efficient vehicles and bikes. 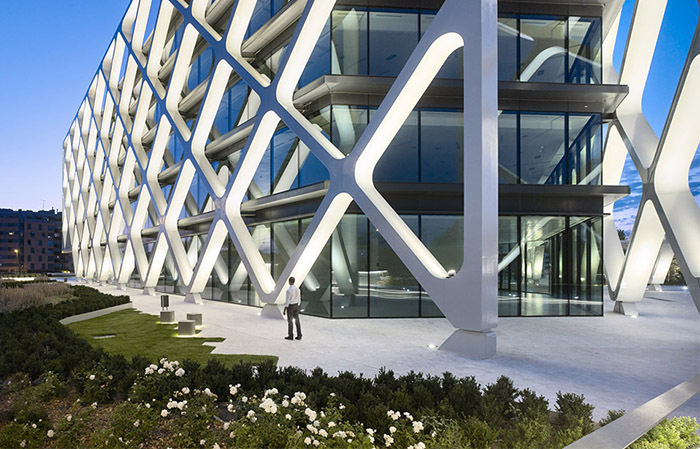 RAFAEL DE LA-HOZ Arquitectos designed oxxeo to the most stringent sustainability standards, emphasising optimal control over the building’s energy consumption and enhancing accessibility. Besides an A energy label, oxxeo has been awarded the prestigious LEED® Platinum Core & Shell certification and the 5-star DIGA accessibility seal; DIGA stands for the ‘accessibility level distinctive seal’ in Spanish and was created by the Shangri-La Foundation. Both certification levels are the highest awarded by either organisation.